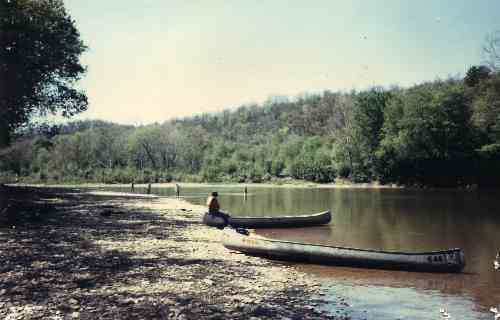 Canoeing is extremely popular in Kentucky, probably due to the state's ideal location. 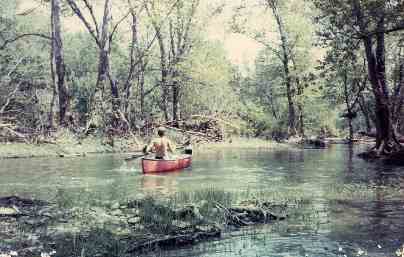 Kentucky has more miles of year round canoeable streams than any other state. And these streams are shallow, rural, scenic, inaccessible to power boats, unpolluted, and filled with fish and mussells. Kentucky is also within a day's driving distance of the Big Water further South, and two days drive from the Boundary Waters in Minnesota. Kentucky offers raging white water, very technical, challenging for advanced paddlers. But it also offers gentle Class I streams perfect for beginners or families just wanting a relaxed day in the outdoors. Kentucky in the 21st Century retains a 19th Century frontier or pastiral feel, and its canoeing streams display the best of this. 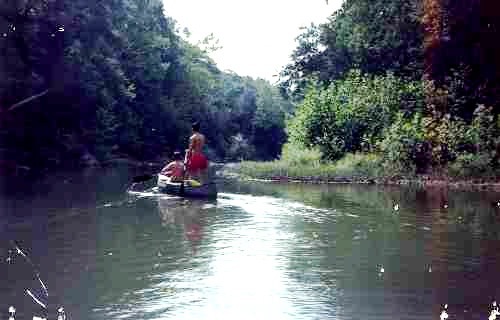 Canoeing is also inexpensive. Many canoes have been in the same family for 100 years, carefully housed in the garage, barn or boathouse during the offseason. This means the only cost is a tank of gas to get to the put in and a lunch or food for a weekend of camping. There are great streams in every part of Kentucky, Indiana and Ohio. Most of the whitewater is in the Daniel Boone National Forest in Kentucky, but Indiana's Whitewater River is almost nonstop Class II, which is lively enough to be entertaining. Most of the Class 1 cruising runs are in Central or Western Kentucky or Ohio. Every stream has outfitters, who will rent you their canoes or shuttle yours for you and come pick you up. The Ohio and Indiana outfitters also offer campgrounds, which sets up a great weekend. You can drive up Friday night after work or school, camp, let them shuttle you upstream and paddle down to the campground Saturday, then paddle downstream Sunday and let them come pick you up and bring you back to your vehicle. This means you can very conveniently paddle 36 miles or so of a stream. But a straight drive down I-65 is the magnificent Pascagoula River Basin, and a few hours east or west of there are the Atchafalaya, Okeefenokee and Suwanee Basins. These are a cross between rivers and swamps, with awesome populations of birds, reptiles, large mammals and fish. Local paddlers use a week or two of their annual vacation time canoeing this Big Water to the South. 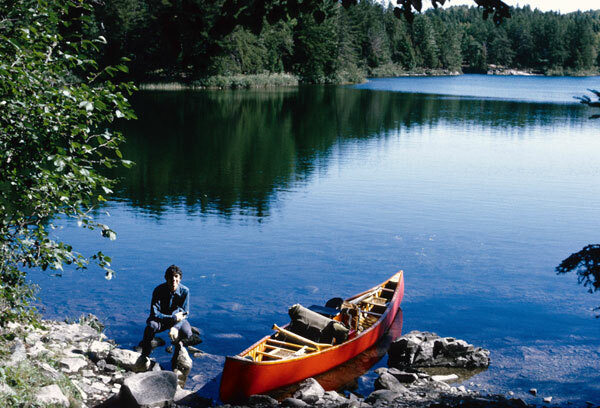 And two days drive north brings you to The Boundary Waters, the world's greatest canoe wilderness. Over one million acres of lakes linked to each other by narrow passages or short portaging trails offers a lifetime of different trips without ever retracing your steps. Thousands of canoeing Kentuckians try to squeeze a week or two at the Boundary Waters in each year, preferably during the peak of Walleye season. "Canoeing" is a generic term. We see a lot of kayaks, johnboats and drift boats. We've tried those others, taking lessons and renting them from outfitters. We've never been persuaded they're the best choice. In Kentucky, Ohio and Indiana streams tend to be "pool and drop," with long flat stretches punctuated by short riffles or rapids as the water cascades down over ledges, rocks and chutes to the next pool. The best route through these drops is not always obvious. It is essential to rise to our knees and get a clear vantage point. With a kayak, which was developed by the Eskimo for use on the open ocean, this is not possible. Even on flat water, after a long time, we like to change from a sitting position to kneeling, which a kayak does not allow. Another issue is overnight trips. We do a lot of them. Regardless of how many pockets they build into kayaks, we can still carry more equipment in a canoe and get at it more quickly. Finally, Kentucky streams tend to be tight, with sharp turns, narrow passages and technical drops. A canoe is much more nimble. Kayakers tried to counter these disadvantages by developing the "squirt boat," which is certainly agile. But it packs even less and allows even less kneeling. So we still prefer canoes. After years of using every canoe imaginable, our preference duo canoe is the Old Town Camper 16 shown here. It's designed for two paddlers but functions quite well with one, as seen. It holds a lot of camping equipment but its high side rails keep cargo high dry. The Camper tracks (maintains a straight line) very well, and its flat bottom makes it extremely stable. Its heavy enough to hold its own in waves or wind, but light enough to lift onto a cartop rack easily. But our real favorite is the Old Town Pack, shown here. 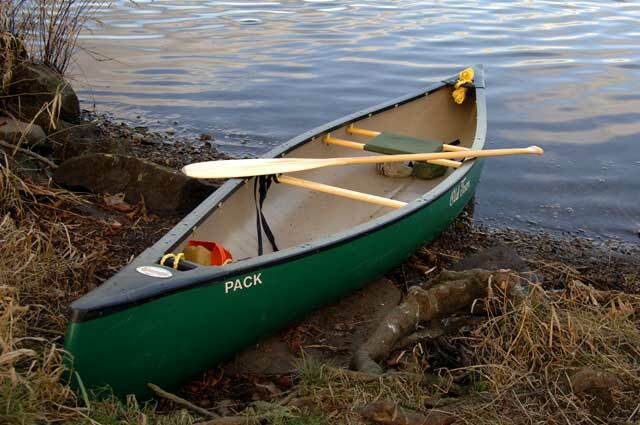 This is a solo canoe. It's 12' long and weighs 33 pounds. It is easy to pick up and carry 20 yards to the vehicle or half a mile to the next lake or river (as in the Boundary Waters). This is a flat bottom (so very stable) boat which is very quick in riffles and rapids. On long stretches of flat water, the Pack is not as fast as longer keeled canoes, but it can get into and aqueeze through and out of tight spots that block other canoes. This photo shows a friend's stripped down model. Ours is tricked out with a swivel seat, knee pads mounted permanently on the floor, underseat bag and gunwale drink holder. We have air bags and splash cover for white water. One option which is becoming more popular is the Drift Boat. These are rowed, not paddled. They're not designed to navigate either white water or small, tight streams. But on slightly larger streams and mostly flat water, they have several advantages. They hold huge amounts of camping and fishing equipment. They can be tricked out with swivelling arm chairs and sealable food boxes. But, most importantly, they can be equipped with canopies and benches so can be camped in. There are Royalex versions, but the wooden ones are works of art.